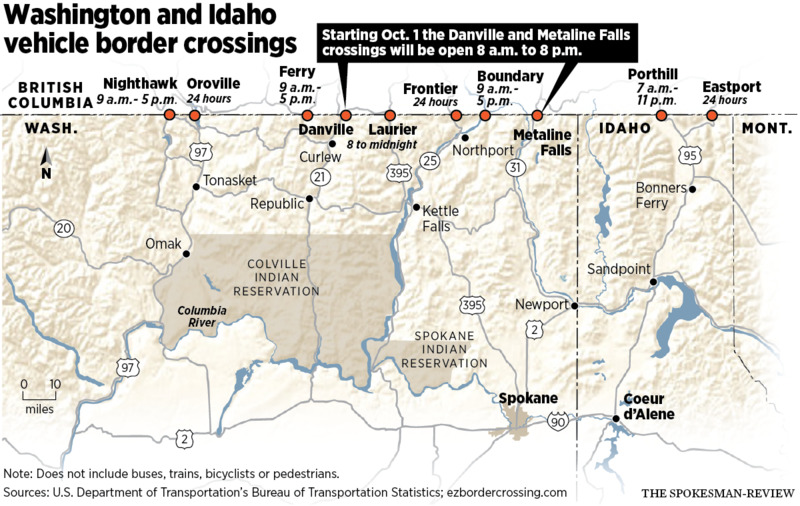 Two rural Eastern Washington international border crossings that see among the fewest crossings in the state will have their hours cut following a decision by the U.S. Customs and Border Protection. The Danville and Metaline Falls crossings will be open year-round from 8 a.m. to 8 p.m. starting Oct. 1. Currently, the border crossings are open from 8 a.m. to midnight. The Metaline Falls crossing, near Nelway in British Columbia, is 110 miles north of Spokane, and Danville is about 30 miles north of Republic. The federal border agency had proposed restricting the hours at the Danville border even more, closing it daily at 5 p.m. for nine months a year. No such resistance to the change in hours came regarding the Metaline Falls crossing, said Jared Powell, spokesman for U.S. Rep. Cathy McMorris Rodgers, R-Spokane. The Congresswoman had opposed the change in Danville hours, saying it would be “detrimental and will only have a negative effect on the communities,” but offered no opposition to the reduction in hours at Metaline Falls. Like some residents who live near Danville, Powell said McMorris Rodgers questioned limiting a border crossing that effectively sits in the middle of a rural community where the biggest town is in Canada. Dawna Borseth, who has owned the 5th Avenue Bar and Grill in Metaline Falls for eight years, said she’d only heard about the reduction in hours from customers. While she doesn’t get up to Canada much, she said there is a community that spans the border. The Danville crossing, one of 14 drivable border crossings in Washington and Idaho, had an average of 67,240 passenger vehicles a year cross into the United States from Canada between 2013 and 2017, according to figures from the U.S. Department of Transportation’s Bureau of Transportation Statistics. Crossings at Danville have been steadily decreasing since 1996, the first year in which data is readily available, when 102,239 personal vehicles crossed. Metaline Falls has always seen far fewer crossings, with an annual average of 34,847 vehicle crossings. The busiest border crossing into Washington is at Blaine, north of Bellingham, which had an annual average of nearly 4.4 million personal vehicles cross. Published: July 25, 2018, 4:03 p.m. Updated: July 25, 2018, 8:31 p.m.